Relations between Europe and Africa are entering a delicate new phase. With the Cotonou Partnership Agreement expiring in 2020 and the consequences of the so-called migration crisis still unfolding, the European Union must negotiate a new long-term deal with its African partners. 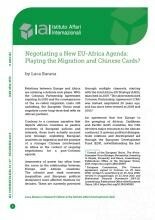 Contrary to a common narrative that depicts African countries as passive receivers of European policies and interests, these have actually accrued new leverage, exploiting European anxieties on migration and the promise of a stronger Chinese involvement in Africa in the context of ongoing negotiations for a post-Cotonou agenda.